I’m going to get a little Zen here … Sometimes a perceived obstacle is actually the way forward. Cue the bamboo flute music. That was the realization we came to when working with the team at Grovemade on a new product launch. It was a logical extension of their brand, and yet something completely foreign to them. Hint: It was a belt. And yet not just a belt, as you’ll see. Grovemade, for the uninitiated, is known for their sleek desk collections, and more recently Everyday Carry items – keyrings, wallets, pocket knives and watches. All reflect Grovemade’s distinct design DNA. So why a belt? Well, the same reason they design anything – to make a cleaner, simpler, more modern interpretation of what came before. Without sacrificing style. And no one else had approached it quite the way they would, yet. The belt came with two modular pieces – the strap and the buckle – no stitching or rivets, no moving parts. It was designed so the buckle snaps securely in place, hiding the holes behind the strap, for an understated but sleek look. Armed with a couple of prototypes, the Creative Jam began. Who wants it / needs it? How did we make it? Why that way? What story can we tell? What’s the best way to tell it? You get the idea … It’s a fun process, with designers, writers, the COO and CEO all lobbing ideas and challenging each other. We began by outlining a few possible approaches. Then we moved on to possible executions for each. Like complex geometric patterns inspired by the lines, angles and chamfers … comparisons with other, more traditional belts … posed with Grovemade’s EC items … real man-on-the-street reactions … and on and on. In general, we had to decide on the most impactful direction, the smartest execution, and the most effective channels. But a more interesting challenge reared its head almost immediately. It came down to perception. Fashion brands are represented in a particular way, and fashion-conscious consumers look for that. But that approach clashed with Grovemade’s established brand identity. And those weren’t our primary customers, anyway. On top of that, established fashion brands have name recognition that’s hard to beat on their own turf, as well as massive advertising budgets we lacked. With that in mind, we adjourned to mull it over. The challenge itself turned out to be the key insight we needed. Rather than try to beat competitors at their own game, we’d reframe the conversation. 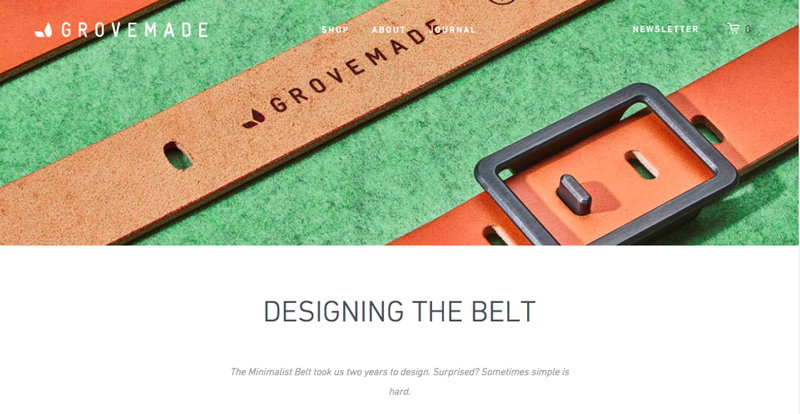 We knew Grovemade’s core customer base (and online audience) was passionate about design. In their home furnishings. In the art on their walls. In their appliances and electronics. And the belt was first and foremost about thoughtful, ingenious design. This idea allowed Grovemade to stake its claim. Now they could discuss the two-year design process where they obsessed over every detail. Highlight the modular, minimalist style, and the forms that echoed their other products (read: their ethos). Reinforce their customers’ pride in their passion … and maybe flatter them a bit, too. The campaign would launch on social media and in email – where their customers were most active. Customers could choose their favorite color combo, or a kit to mix and match different straps and buckles. Animations and illustrated inserts showed how the modular components fit together. And blog posts took readers through the long design process, inviting them behind the scenes for a more intimate perspective. The belts sold out within six hours of launching, with plenty on backorder. This happened twice more over the next few months. No one expected a response on that scale. So when is a belt not a belt? When it’s an impressive example of product design. When it’s a way of looking at the world – a philosophy even. When it’s an expression of style, not just a slave to fashion.